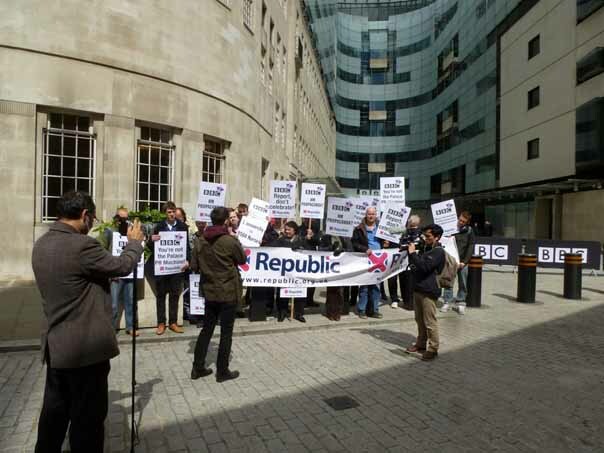 Fed up with the way the royal baby had been reported, Republic organised a demo at the new Broadcasting House extension against the biased commentary, downright arse-creeping. 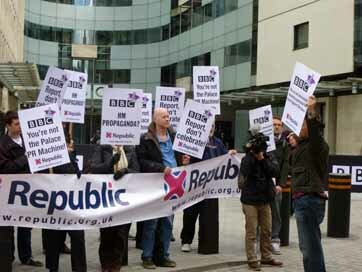 Ken had a go on the tannoy, reminding supporters of John Temple's article in the "Guardian" in 2004, asking for the royal family to be DNA tested, "so we could see we were getting what we were paying for" & the subsequent & immediate passing of a law making it a crime to DNA test anyone without their constent, virtually confirming that Princess Diana's children were not the sons of Prince Charles. There have been & are, a lot of new flats going up in our area. That might be good news but it is not. They are being bought by the shedload by foreign investors as a way of hiding their ill-gotten gains in 'safe' London & they are not letting them out, so they just stand there empty. With a housing list the size of Islington's, this is an appalling scandal & while the Council & our MP Emily are aware of the situation, there is little that can be done about it while the market-worshipping (i.e. rich mans' patsy) government is in power. How much more can people take of this bunch of crooks before something snaps? On the subject of flats: no Business Page this year but we did spend a small fortune (£40k) on doing up the flats in 10 St. Peter's Street, remodelling the basement entirely, putting a new kitchen & flooring in Flat 2 & other repairs to the other two flats. This page's URL: http://www.art-science.com/Xmas2013/campaign.html Last revised 1/12/2013 Copyright: ©Ken Baldry & Avis Saltzmann 2013 All rights reserved but print it off if you want to.